Hi guys! Happy Tuesday! Did you have a good long weekend? Mine was so so fab! We went to Vegas Saturday-Sunday and then went to one of our fave total hole in the wall Mexican restaurants on Sunday night, then had a fab + super laid back Memorial day at home yesterday. I took a little social media break and it was SO refreshing! Not that I don’t love seeing everyone’s pics and what everyone is up to, because I do, it’s just really nice to take a little time to myself and reality too! 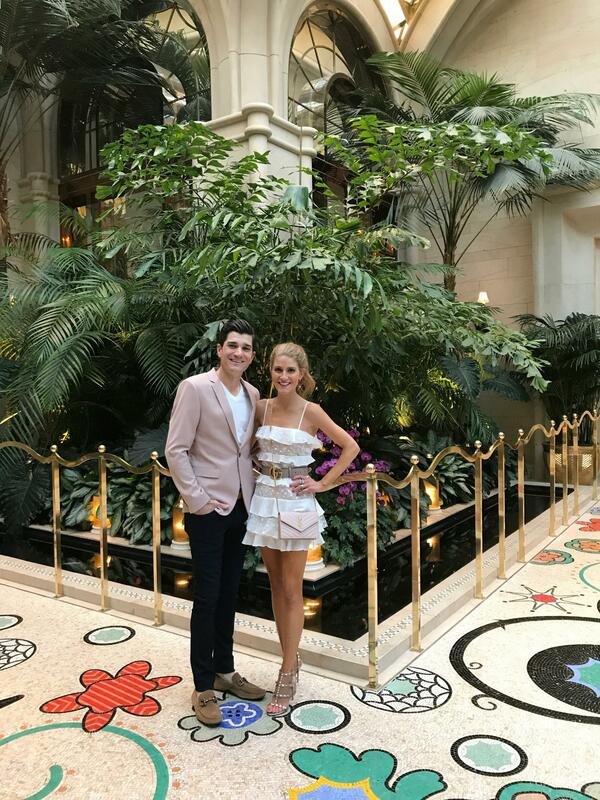 Today I am sharing why we love Vegas and what we love to do there as I get tons of messages asking what my favorite hotel and restaurants are. To start (and sorry if you have been following my blog for awhile and have heard all of this! ), our go-to and most favorite hotel is most definitely the Wynn. I have stayed at probably every hotel on the strip and I honestly will not stay anywhere but the Wynn anymore. The hotel itself is so well manicured and taken care of. Just the lobby area alone is gorgeous! It’s like a little wonderland of amazingness. The casino is really nice, clean and not too smokey. The scene is definitely more mature, but that’s why we love it. 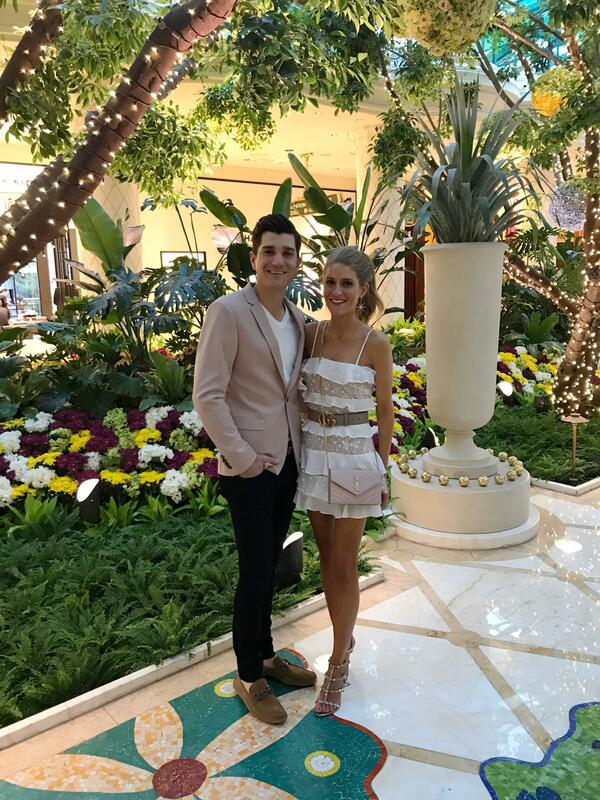 Of course if you are going to Vegas for a bachelorette or some sort of party, it’s fun to stay at the Cosmo or Aria where you get a much younger crowd and more vibrant bar scene. Back to the Wynn, the rooms are insanely spacious and so pretty! If you go on their website you can see, but the decor is all cream and white and just so nice. The spa is super luxe and then there are tons of fab restaurants and bars. One of most favorite things to do is going to the Parlor bar right near the lobby right when we arrive. It’s situated so that you can people watch in all directions (which in Vegas is total must!). As for food, Sinatra is definitely our fave spot to eat at the Wynn. It’s Italian and seriously SO good. Plus they treat you like total gold when you are dining there! Outside of the Wynn restaurants we love for dinner: Nobu (the one at Cesar’s), STK at the Cosmo, Beauty + Essex also at the Cosmo, Sushi Roku, Aquaknox and Mesa Grill. Other than eating, we love to be silly and play all the fun slots. Britney Spears, Michael Jackson, Dolly Parton and Pitbull are our top 4 favorites as they all play the best music! I literally won $300 this past weekend playing Dolly and jamming out to “9 to 5”. Hilarious, right? Obviously shopping is another one of my fave things to do there as the options are insane! And our last thing we love to do is ride the the new huge ferris wheel, the Linq High Roller. We have been twice and it’s just so cool. It’s only 30 minutes and you get the most fab views of Vegas as well as free drinks the whole ride. It’s super cool and definitely worth doing if you haven’t! I share all of this because I think Vegas has such a terrible reputation and most people think you only go there to party like crazy. Our version of Vegas is so mellow, but still so fun! Of course it’s also fab to do Vegas the traditional way, but I really think our way is best way! A couple cocktails, a nice dinner, some slots, maybe go dance a little at a club and still be in bed by 1am in a nice hotel room….basically the best date night ever! Feel free to message me if you have any of other questions, but I think I covered it!! Below are all the details of our looks from Saturday night. I am OBSESSED with this For Love and Lemons dress…..it’s frilly, flirty and so fun!! And this blush colored Topman blazer that Colby is wearing is SO end all for Summer!! Have a good day friends! I am trying to get back to reality after our super fab weekend…..it’s always so hard! Happy mid-week, friends! I had the best weekend with my sweet momma (so many yummy meals and lots of good catching up) and have been getting organized this week. The weather has been so lame these past few days here and I am looking forward to some hopefully warmer weather this weekend. I can’t believe it’s already mid- May and almost Summer! I love this time of year, but just wish it would all slow down a bit! Today I am talking about my current obsession: boyfriend cutoffs. They are everywhere and I must admit at first I was a skeptic, but I think like all trneds, it just takes finding the right fit. I found these, from Moussy, on revolve.com just love the super distressing and the high waist. I think the key with this style is to get them more fitted at your waist so they still come off more feminine. I of course think it’s essential to throw on a fab belt (like my Gucci pearl one), but you dont have to. I just think a belt adds another element of femininity and of course some much needed personality. I am also all about the the fact that yellow is huge this season. I am forever a lover of yellow as it’s just such a happy color and can be a great neutral. I fell in love with this dotted House of Harlow blouse on revolve.com and knew it would be even better in real life. I love love this top! It’s such a gorgeous shade of marigold yellow and it’s such a wearable fit. It looks great with white denim too! Another way to keep your boyfriend cutoffs girly is to dress them up with a fab heel like these Valentino rockstuds. Of course you could go with a bit more simple wedge, but I love and prefer the contrast of mega-girliness and laid back masculinity. If I was wearing a simple tank or tee and wanted to go super casual, I would go with a bow slide (like these) or a gladiator sandal since both of those are again more feminine.